Not every state is an ideal location for solar panel energy use but for most, the sun shines for at least some of the year. Minnesota might not seem at first to be the ideal place for solar installations. Snow falls in at least three of those seasons, but this does not mean that it doesn’t get its own share of sunshine. 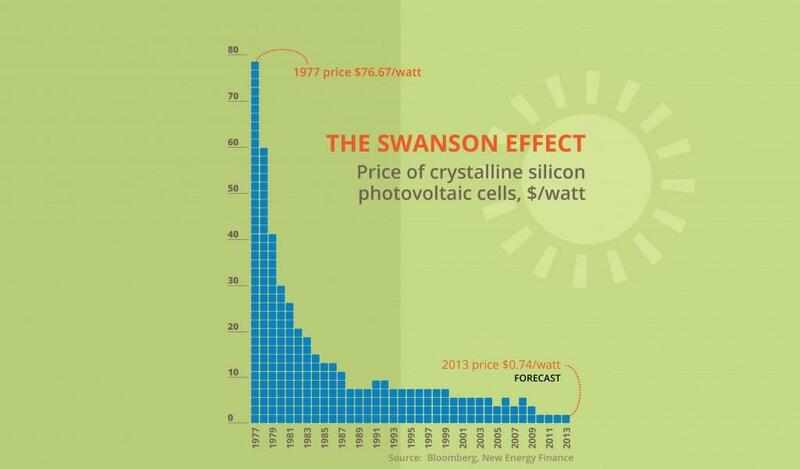 The Swanson Effect Graph below was developed by the founder of a solar panel manufacturing company Richard Swanson. He termed the graph Swanson’s Law as he observed that solar photovoltaic modules tended to drop 20% for every doubling of global manufacturing. 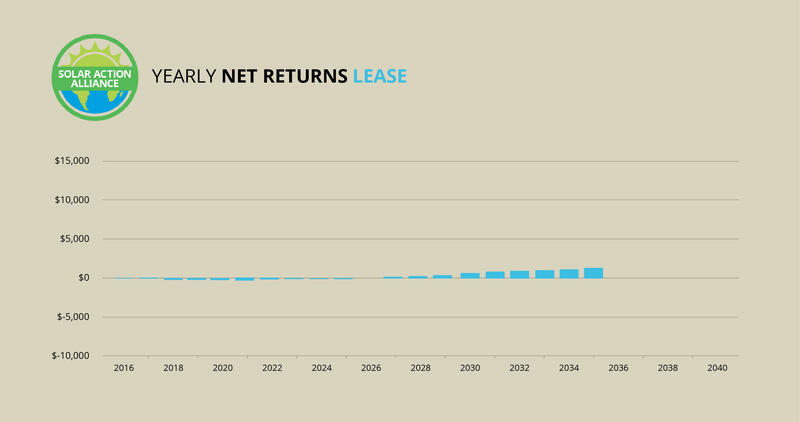 At current rates, costs go down by half every 10 years. The cost of a crystalline silicon photovoltaic cell fell between 1977 and 2014 from $76.67 per watt to $0.36 per watt. The upshot is as seen on the Swanson graph below that the modules which are used to make up solar-power plants typically do not even cost as much as a dollar for each watt of capacity. The construction of a power station could add another $4 but with these construction prices dropping all the time this amount will start to decrease too. Once your home constructed solar power station has been completed the fuel is free. You couldn’t ask for better than that. Solar panels and installations are at their lowest prices ever. They are set to drop further making them one of the most cost effective solutions for solving your electricity needs. The better known energy companies know that the seasons don’t really matter, as long as the sun is shining. Minnesota’s utilities support performance payments and solar power rebates, so that homeowners who own solar power installations can lower their costs. Full tax exemptions apply in Minnesota and the state’s renewable portfolio standard (RPS) make the prospects for solar power in this state pretty impressive. Before starting your solar power investment you have to familiarize yourself with the possible options available for purchase and installation of solar in Minnesota. It is possible to buy an installation outright if you have the cash or get a loan or arrange a lease or a power-purchase agreement or PPA. The graph above reveals the twenty five year returns possible for a solar investment, depending on whether you pay in cash or pay with a loan or arrange a lease. 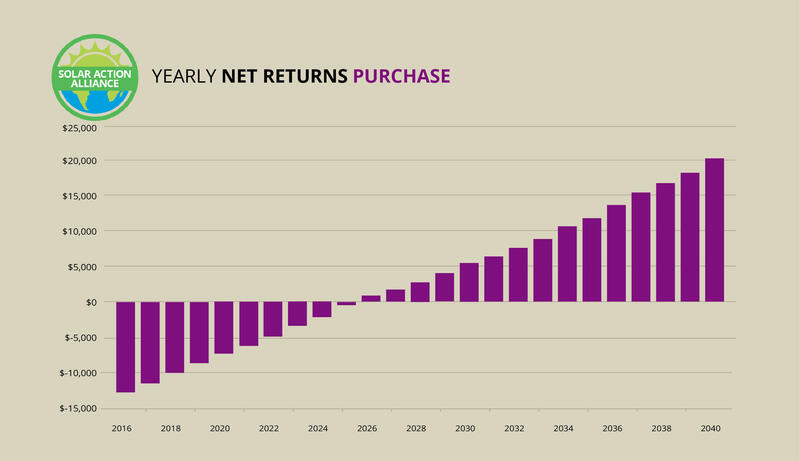 The purchase option typically leads to the greatest dollar return over time. However, taking out a home equity loan, or line of credit, while paying for the solar system over a period of time, means you will actually be putting down less personal money, while gaining financially in the first year. If you take out a loan like this you are still eligible for a federal tax credit of 30%, which is based on the total cost. You’ll make an impressive head start so your payments over a 15 year period will not have such a great impact as paying out a significant amount of money up front. All you will need to start is equity or a good credit rating. Solar leases and PPAs offer the least amount of saving, but you don’t have to put anything down in the first place for your rooftop solar installation as you pay monthly, but you will accumulate savings on your electric bills over time. Taking out a lease or a PPA is still an excellent choice if you have no equity available or cash, as you can still make a saving. Leasing is an option to choose if the cash or equity is not available. You will typically see savings materialize in a 20-year period. Minnesota doesn’t offer quite the same financial benefits as those states that experience more sunshine, or those with higher electricity costs, but the leasing of a 5kW solar installation will still attract a substantial saving of $761 annually, but will cost $800 a year. This might not sound worth considering, but as utility companies increase their rates, monthly savings will start to make a significant gain. Over a 20 year period, you could still expect to save $1,070. These numbers don’t seem over impressive, but you are getting a solar powered home for next to nothing! This means you can impress your neighbors by being green. Remember that you are contributing to help decrease greenhouse gas emissions and that will help generations to come. Just to be a bit more positive, the panels won’t need to be maintained or repaired by you, either, as this will be left to the professionals employed by the solar provider. Average yearly savings is $343. 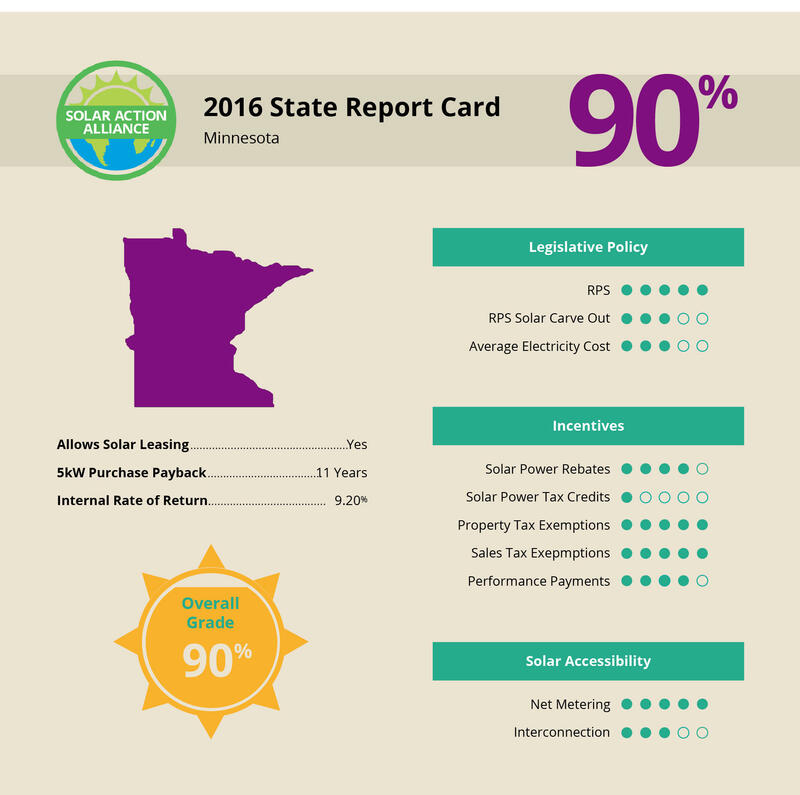 The numbers shown indicate possible savings for an average Minnesota home with a solar lease. The average electricity bill before the use of solar power is mega expensive, but a solar lease reduces your monthly expenses substantially. With a solar lease, you are renting out your roof area to a solar installation company which is responsible for maintenance as well. You have to front up with a monthly payment so that you can access the power the solar panels are producing. The payment you have to make plus the fact that your usual electricity bill will be far lower means your savings are instant and you still have money left in the bank. Nothing could be better than that in days of high power demands. With a PPA (power purchase agreement) your roof is used for the solar panels, but you only have to pay out for the electricity the solar system generates at a price that is far lower than any payments you have made to the utility company you are hooked up to. The money saved is limited by the amount of sun your roof gets. Whether you decide on a solar lease or a PPA, the company that undertakes the installation will own the panels but they are also responsible for all maintenance. That means if anything in the system fails you do not have to take any responsibility for it. If you select to lease out your solar panels, you gain by not having to pay out a large amount of cash but you experience straight away a reduction in the total cost of your electricity. The only noticeable disadvantage is that you won’t make the same financial gains as owning the panels outright. Typically, if you have the cash available, or you are eligible for secure financing, the price of the installation of solar panels turns into an investment which comes out with a return that surpasses even investing in mutual funds. Also, the sun is more predictable than the financial markets! If you choose the leasing option you do lose any state initiated credits and any performance payments, too. 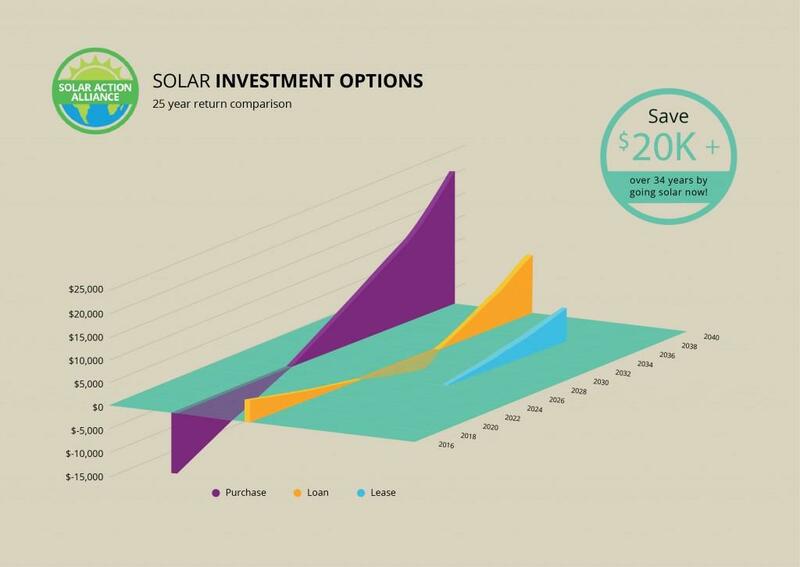 You don’t need $20,000 cash to buy solar panels, providing you have some equity in your house. You can own all your solar panels and make considerable gains from just that. If you do have the cash you don’t need to use it up, as a loan is a far better way of paying when you calculate the likely percentage gain on your investment. Typically in Minnesota, taking out a loan to fund your solar dream is similar to investing money in a business which has a high likelihood of being successful and you can get a big tax break too. In fact just in the first year you stand to get several thousand ahead and you will still make an attractive profit throughout the 25 year lifespan of your installation. You can obtain a $20,000 home equity line of credit (HELOC) at a fixed rate of 5% or less with a 15 year period to repay. This is the amount of money you require for a standard 5kW solar installation. The electricity you will expect to save in the 1st year of your solar system would have come to $761, but your yearly loan payment will amount to $1,898, so you will spend $1,137 this year on solar but that’s not all, as you will be eligible for a massive tax break. The federal government will give you back 30 percent of the money you have paid for your system as a tax credit, valued at $6,000. You have committed to paying over a period of time but you still benefit. Over and above your electricity bill savings, your utility company is committed to paying you on average $0.08/kWh and you can expect your system to produce annually 5,850 kWh, so you will gain a further $468 a year for at least 10 years. With all the incentives you will be $5,331 ahead in just one year. You will pay a loan payment of around $90/month which is more than the savings on your energy bill but that differential will seem far smaller as inevitably the utility company will raise its rates each year. Your loan will be paid off by 2030 and after the 25 year lifespan of your solar installation your profit will have reached $11,830. Don’t forget that by switching to solar you will also have saved 106 trees! Study the credit option on the graph below. 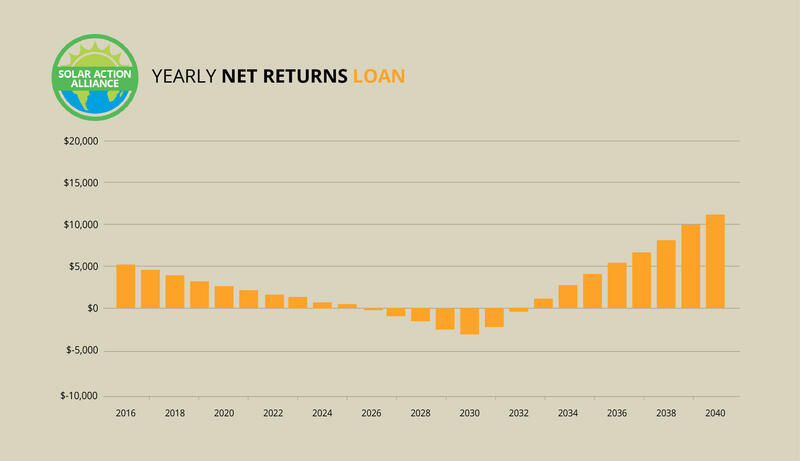 An outright solar panel purchase still produces the greatest financial return but on a percentage basis a loan is a better choice. See the graph below. If you do have some usable equity in your house or you can obtain a larger enough loan with a 5 percent or less interest rate that’s the best option. If you have cash, making a cash payment of $20,000 is your preference. Over a 25 year period your solar system will have gained for you an income of about $20,000 after you have paid back the cost of your system. The reason why this does work is because the solar affects the cost of your electricity which is sufficient to bringing about a saving of $760 in the 1st year alone. You start to make more savings each time the electric company hikes its rates. * $20,000 is your initial layout. From the Feds comes an incentive based on what you have paid, so you can take 30 percent off $20,000. This gives you a $6,000 tax credit. *Xcel will pay to you $0.08/kWh and your system which will produce per year 5,850 kWh will mean you will be paid $468 by Xcel so now you have paid out only$12,772. You will be paid continually in the same way for the following 10 years. *Your solar system will in the end pay for itself through savings on your electricity bills and you will end up with a $20,301 total net profit in 25-years which works out at 9.21%. A very favorable rate of return compared to a stock market investment. This is all shown in the graph below. 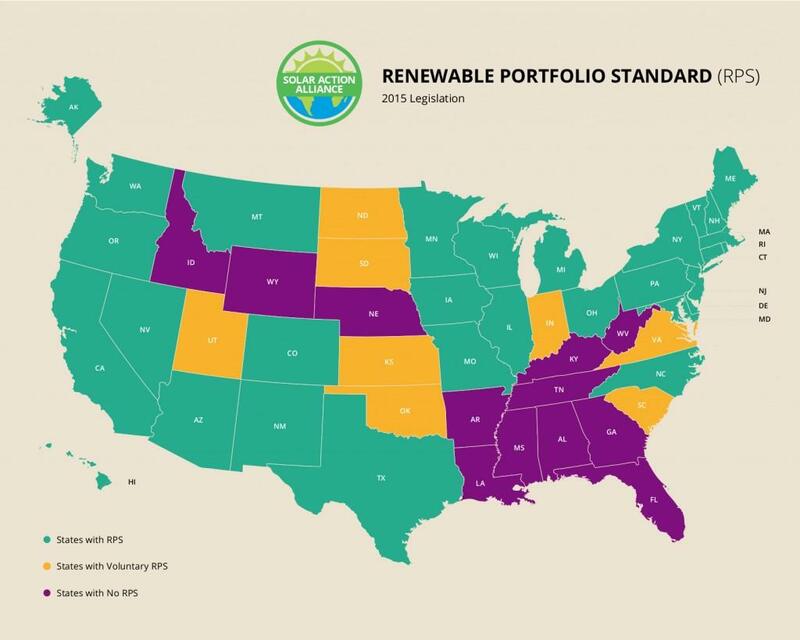 A Renewable Portfolio Standard or RPS is state regulated and determines what percentage of energy production in the state should be derived from renewable resources. Having a good RPS is important as it puts real pressure on utility companies to source energy from renewable resources. Minnesota sets specific targets for Xcel which is the biggest electricity company in the state which is the requirement to generate by 2020 at least 31.5% of its electricity from resources that are renewable. The minimum at the moment is set at 18%, with a rise to 25% by 2016 and then 31.5% by 2020. The remainder of Minnesota’s utilities must produce 25% of the energy they supply from renewable resources by the year 2025. This requirement applies to investor-owned utilities as well. If utility companies fail to conform to these standards, they have to pay compliance fees to the state directly. Utilities typically attempt to adhere to these RPS standards through offering to the homeowner solar power incentives. The Minnesota state legislature in 2013, put into force H.F. 729, which sets a requirement for Xcel and all other public utilities to provide 1.5% of their electricity by 2020 from a solar source with 10 percent coming from smaller scale solar installations of less than 20 kW capacity. This means the utility companies are going to offer rewards to owners of home solar installations. Many states offer tax credits on home initiated solar power installations, but Minnesota hasn’t stretched their incentives that far yet. A solar power system which has just been installed is totally exempt from property taxes. As you would expect your home will rise in price by the value of your solar power additions but you will never have to pay any property taxes on this rise in value. In Minnesota, most products attract 7% sales tax, but solar power installations do not attract any sales tax at all. Xcel doesn’t stop with its solar incentives to Minnesota residents who are planning a new solar installation in their homes. Xcel Energy users are able to enroll in their Solar Rewards for rebates which are up to 8 cents a kWh, but must not exceed 120 percent of the user’s energy usage. This Solar Rewards program offers a saving of $500 each year above any other savings on bills and it continues for 10 years. The incentives to switch to solar power in Minnesota are endless as you get money off for buying solar panels produced by any Minnesota company. However complex the rules are for solar panel installations in Minnesota, anyone who is contemplating this green route for their home will be a winner financially all things considered. Whatever you decide to do, if you opt for a solar roof, you stand to gain in the long term. 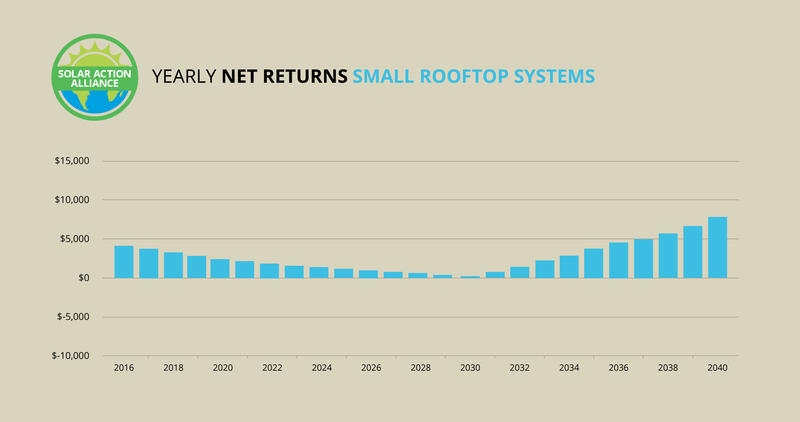 The longer you have a solar roof, the more financial gains you are likely to make. There is no indication that anyone is going to find huge new reserves of fossil fuels anywhere on the planet to replace the stocks that are dwindling away at present and there is no indication that the atmosphere can handle all that pollution for much longer anyway.